Resources shared here were initially adapted from the March 2013 Challenges page of the Oklahoma Scratch Camp website. Explore different kinds of Scratch Projects! Start by dragging out the “move 10 steps” block from the “Motion” blocks palette to the scripting area. Every time you click on the block the cat moves a distance of 10. You can change the number to make the cat move a greater or smaller distance. From the “Sound” palette, drag out the “play drum” block. Click on the block to hear its drum sound. Drag and snap the “play drum” block below the “move“ block. When you click on this stack of two blocks, the cat will move and then play the drum sound. Copy this stack of blocks (either using the Duplicate toolbar item or by rightclicking the stack and selecting “duplicate”) and snap the copy to the alreadyplaced blocks. Change the second “move” block to -10 steps, so the cat moves backward. Every time the stack of four blocks is clicked, the cat does a little dance forward and back. Go to the “Control” blocks palette and grab the “repeat” block. Wrap the “repeat” block around the other blocks in the scripting area. Now when you click on the stack, the cat dances forward and back 10 times. o Finally, drag the “when Sprite clicked” block and snap it to the top of the stack. Click on the cat (instead of the blocks stack) to make the cat dance. For your third Scratch Project we'd like you to make an ABOUT ME project. Check out some of these examples. 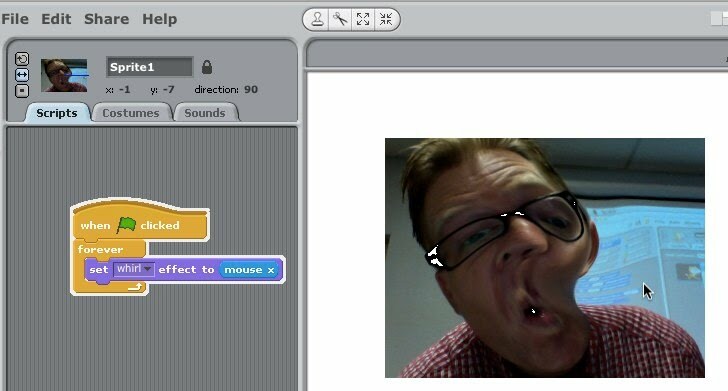 Check out this Gallery of Scratch Storytelling Projects. These Scratch Blocks are helpful when creating stories. First 15 minutes: Start a Scratch story using one of the storytelling models above. Second 15 minutes: Switch computers and continue working / adding to a Scratch story started by one of your classmates. In 15 minutes, create a cool project in Scratch using just these 8 blocks. These were included in Karen Brennan's ScratchED post, "BLC Pre-Conference Workshop: Let's Play! Game Design with Scratch - Monday, July 15, 2012"
Create your own MAZE Scratch game! Check out this sample MAZE game for ideas and helpful blocks to use. This handout has helpful tips and instructions for creating a MAZE game! This tutorial explains how to start a new level also! These links were included in Karen Brennan's "Let's Play" post on ScratchED. These blocks (PDF) are very helpful for creating games in Scratch. Use these blocks to create your own simple game.